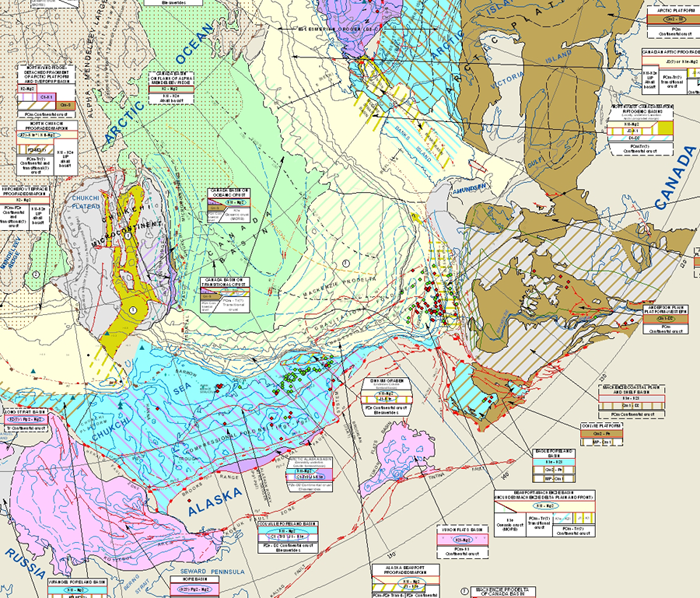 AAPG Datapages wishes to thank Arthur Grantz, Robert A. Scott, Sergey S. Drachev, T. E. Moore and Zenon C. Valin for allowing the Map Showing the Sedimentary Successions of the Arctic Region (58°-64° to 90°N) that may be Prospective for Hydrocarbons to be posted on Datapages' GIS Open Files page, thereby making it available to the public as a free download. "Assessment of the petroleum potential of the Arctic Region is handicapped by incomplete knowledge of the location, character, age and geologic setting of the sedimentary successions that underlie this large, remote and incompletely mapped region. The accompanying map (Plate 1) attempts to fill this void by displaying all of the supra-continental and submarine sedimentary successions in the Arctic Region (variously 58°-64° N to 90°N) that are known or inferred to lie at or near the land surface or the seafloor on the basis of currently available data. The map consists of four quadrants--Alaska and Arctic Canada, East Siberia, Barents/Kara, and Greenland) at a uniform scale of 1:6,760,000. This scale was chosen because it is the largest that will allow the map to be printed on standard 42 inch wide printer paper. An Explanation and Time Scale for the map is presented on Plate 2. A total of 143 sedimentary successions known to contain hydrocarbons that were either generated internally or expelled from other successions, or which appear to be sufficiently thick to warrant at least consideration of their hydrocarbon potential based on their known or inferred thermal gradients, were identified in the Arctic Region in the present study. The successions range in age from Late Mesoproterozoic (mid-Riphean) to Cenozoic and, within the confines of the Arctic Region, range in size from less than 100 to more than 50,000 sq. km. Summaries of the tectonic/morphologic character, location and apparent hydrocarbon prospectivity of the sedimentary successions identified within the confines of each quadrant of the map are presented in tables located in the adjacent map margins." This map, which is the Second Edition, is available in PDF and ArcGIS format.